Forward Looking – as accountants we are used to looking in the rear-view mirror, as we prepare financials, file taxes, do variance reporting, etc. These are all necessary for consumers of that information (banks, investors, consultants) to understand what is going on at the company. But as the operators, we need to peak into the future because things will not remain as they are. For example, Sales numbers show you how you did. Activity measures show what the pipeline might look like in six months. Activity-based – To achieve a desired outcome, someone on your team must take action. This action in concert with other actions define a process that ultimately will lead to success. So, less focus on outcomes (budget vs actual) and more on what it takes to achieve those outcomes. Desired Outcomes – Initially, much thought must be given to the desired outcome focusing on the behaviors you want to incent. Again, these become the activities that you measure. Truth #6: A Scorecard requires hard work, discipline, and consistency to manage, but it’s worth it. 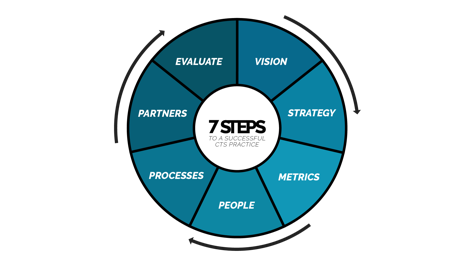 Interested in a quick recap of our “Seven Steps” blog? In the next post, I will talk about Step 4 – People. In the meantime, please feel free to reach out to me I can assist you in any way as you build your client transformation practice.